There are two legs to the duplexer filter, one is tuned to pass the input frequency, the other is tuned to pass the output frequency. Both legs of the filter are coupled to the antenna. The repeater receiver is connected to the input leg while the transmitter is connected to the output leg. 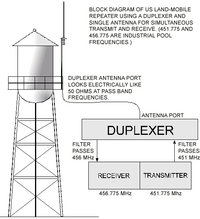 If the right specifications are chosen, the duplexer has a narrow-enough filter to prevent the repeater's receiver from being overloaded by its own transmitter. By virtue of the transmitter and receiver being on different frequencies, they can operate at the same time on a single antenna. Any anomaly or fault with the antenna or antenna feed cable will reflect transmitter power back into the receiver, possibly causing the receiver to be overloaded. The reflected power will quickly exceed the duplexer's filtering ability. This page was last edited on 31 March 2014, at 02:36.